Nowadays, manufacturing businesses rely heavily on their automation, instrumentation and control data communications for industrial networking. When it comes to relaying signals between devices, machinery and the control system, there’s no margin for error. Indeed network availability of 99.999 percent uptime or better is often the goal. Given this reality, a robust industrial Ethernet infrastructure consisting of environmentally-hardened network cabling, connectivity and active components is essential to long-term performance and reliability. Maximum productivity with minimal downtime is paramount for achieving network performance. If a switch, connector or cabling system in the plant fails, the cost of parts replacement and repair represents only a tiny fraction of the overall costs of production downtime. If a cabling system component or Ethernet switch fails in, for instance, a power generation facility, the repair/labor costs alone could be 15-20 times the cost of the component itself. The indirect costs of Ethernet system failure in any industry must take into account loss of productivity, delayed downstream processes, cost of system shut-down and start-up, and the potentially devastating loss of service to customers relying on the plant’s mission-critical output. That’s why investing in a high-quality; rugged Ethernet infrastructure designed specifically for use in harsh environments is a wise business decision – one that can provide tremendous peace of mind to network engineers and the organizations they serve. Industrial grade cable is essential for achieving high availability and productivity in manufacturing and process control environments. Any physical deterioration or electrical failure in key data transmission components can lead to unreliable network performance and/or safety issues. Bringing commercial, off-the-shelf cabling products into the industrial landscape carries high risks for mission-critical applications. As the cable image below shows, the key differences between an industrial grade cable and a commercial grade are the oil, chemical and abrasion-resistant outer jacket shield, as well as a braid designed for specific trailing/torsion applications. For patch cords, there are various types of protection: IP20* overmolded protection, IP67 and IP68 dust penetration protection, IP67 temporary water submersion resistance and IP68 permanent water submersion resistance. So how can you make sure the cable you select is fit for the industrial environment and right for your application? At Belden, we conducted a series of tests to compare the physical and electrical performance of commercial off-the-shelf (COTS) cables with industrial cables. I think you will find the tests and their results quite interesting. Using a fixed drum covered with sandpaper, cables were stretched across a portion of their circumference, then moved back and forth cyclically for 25 cycle counts. Result: After 25 cycle counts, the conductors of the commercial grade cables could be seen through breaks in the jacket, which would cause it to lose mechanical and electrical integrity. The conductor pairs of the armored industrial cable were not compromised. Conducted according to UL 444, samples of cables were left in a controlled temperature and humidity chamber called a ‘cold box.’ They remained there for one hour prior to testing. They were then tested (at -80°C, -60°C and -40°C) by being partially wound around a 3-inch diameter metal bar with one end of the cable under tension from an aluminum weight. The cables were then unrolled and visually inspected to check for cracks in the jacket. Result: The commercial grade cables became brittle and showed visible cracks. The industrial grade high/low temperature cable had no visible damage. Conducted according to UL 444, an aluminum weight was dropped down a hollow guide-tube to smash against a segment of the cable. The impact force delivered 24 in-lbs, or 2.7 joules, of impact energy. Each length of cable had been previously cooled, and a total of ten samples was inspected at a series of increasingly lower temperatures to determine if the cable jackets’ integrity was damaged – which could allow ingress of chemicals and moisture, a conductor-to-conductor short or even catastrophic failure. Result: The standard commercial grade jacketed cable failed at -20°C. The industrial grade cables, protected by high-low temperature jackets, did not crack until impacted at -70°C. An Instron machine head brought a 2-inch by 2-inch plate down on a segment of cable to crush it – with failure defined as the point at which the cable would no longer reliably support Cat 5e performance. Each cable’s electrical characteristics were measured throughout the testing. Result: At 400 lbs. applied force, the commercial grade cable with PVC jacket failed – it was smashed flat and would not spring back to its original shape. The industrial grade, black-jacketed, armored cable had a failure value of 2,250 lbs. – that’s more than a ton. 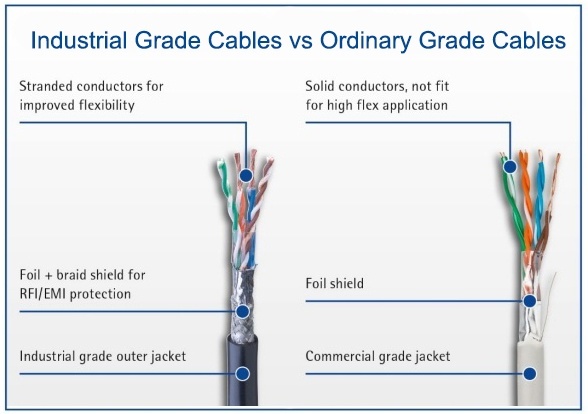 A comparison of industrial grade and commercial grade cables. Based on CSA standard C22.2, a chisel-point mandrel on an Instron machine was lowered onto a segment of cable to test the cable’s susceptibility to a cut-through leaving the conductor exposed. Several kinds of cable were sliced by the chisel to the point where a short circuit was sensed across the conductors, creating a potentially hazardous situation. Result: The commercial grade cable shorted out at 92 lbs. of applied force. It took 346 lbs. applied force to pierce the armored industrial cable. However, the conductors did not short until a force of 1,048 lbs. was applied. Three spools of cable were suspended from a mandrel in a high-temperature oven. The cables were first tested at an ambient temperature of +20°C and were then tested again after being exposed to a high temperature of +60°C over time. Result: The commercial grade cable functioned acceptably at +20°C, but over time, at +60°C, attenuation increased to where the cable would not support a run distance of 100 meters. The industrial grade cables, even after exposure to +60°C over time, continued to support the maximum run distance. Conducted according to UL 1277, lengths of cable were immersed in containers of oil, which in turn were immersed in a water bath that was placed in a chamber held at +125°C for 60 days. After the test period, cable segments were removed and their jackets evaluated for tensile and elongation properties. 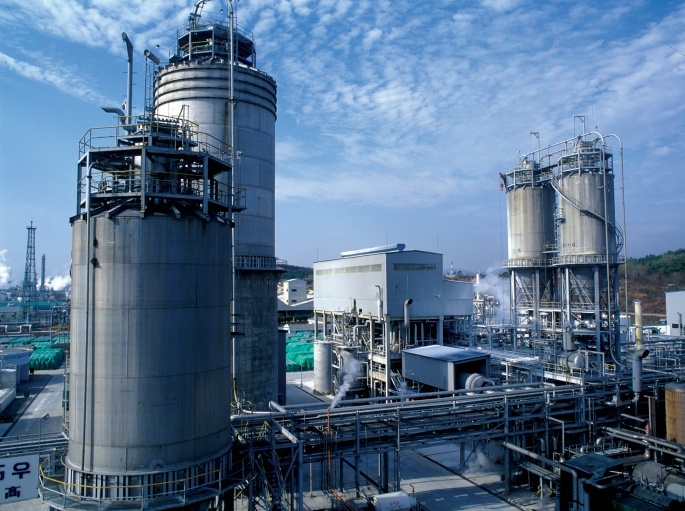 Exposure to oil and lubricants can make jacketing brittle and fragile, even at room temperature, resulting in loss of mechanical properties and reduced service life. Result: The commercial grade cable showed signs of this type of deterioration. The industrial cable’s jacket showed no signs of deterioration, because the materials and jacket thickness are rated for exposure to oil and other substances, even at elevated temperatures. The image on the left shows the oil bath test, as per UL 1277. On the right the water bath test is shown. It is a six-month long test, with the cables fully submerged in water. In this procedure-based ASTM G154 test (Standard Practices for Operating Fluorescent Light Apparatus for UV Exposure of Non-Metallic Materials), segments of various cables were affixed to panels that were mounted so that the cables directly faced a fluorescent light source whose output range was adjusted to match that of solar radiation levels. The cables were exposed to light for 720 hours (30 days), then their jackets were visually checked for discoloration, as well as for signs of degradation in tensile strength and elongation. Result: The commercial grade cable was not sunlight resistant: jackets showed discoloration, a precursor to degradation of the jacket material. The industrial grade cables were rated to resist the effects of sunlight and other UV sources and showed no jacket damage. At the beginning of this test, the electrical properties of the cables (primarily attenuation) were measured. Then, the cables were coiled into a dry container, and water was added to submerge them. The cables were tested intermittently over a six-month period. Result: The commercial grade cable showed increased attenuation as soon as it was immersed in water and this continued to degrade over the half-year immersion. After six months of immersion, the industrial grade cable showed only a slight increase in attenuation – and the cable still exceeded the Cat 5e requirements. After reading about the results of our 9 tests, I think you will agree that there is a significant difference between standard Ethernet cables and cables designed for industrial use. The latter are designed and built tough enough to withstand the hazards and risks they are exposed to day after day. To reach your goals of reliability, quality and performance, I suggest you use only industrial Ethernet cable and connectivity solutions. Belden’s DataTuff® cables, specifically designed for manufacturing environments, for example, will ensure you don’t experience the costs and downtime associated with cable and connectivity issues. How do you make sure that the cable you use is tough enough for long-term reliability? We look forward to hearing from you. Blog: Industrial Ethernet Cable: Should It Be Copper or Fiber? * The Ingress Protection (IP) rating system is set by the International Electrotechnical Commission (IEC) and it classifies the degree of protection that an electrical enclosure provides from external materials in order to operate. The first number identifies the degree of protection against solid objects and the second number identifies the degree of protection against liquids.